This morning, I woke up with a surprising news from my wife, Fifi. We have a pope! 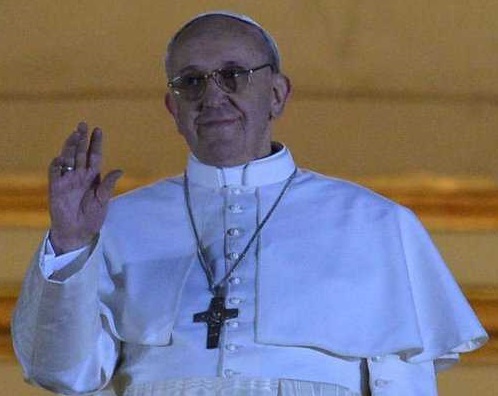 That was the announcement the world was anxiously waiting for; the election of a new pope in the person of 76-year old Jorge Mario Cardinal Bergoglio, S.J., now Pope Francis I. It has been reported that Cardinal Bergoglio was actually the man who received the second highest number of votes during the 2005 conclave which elected Joseph Cardinal Ratzinger to the papacy, who then took on the name Benedict XVI. Unbeknownst to many, the historic resignation of Pope Benedict XVI and election of Pope Francis happened just more or less a month after the installation of the new Anglican Archbishop of Canterbury, the Most Reverend Justin Welby, who succeeded the Rev. Dr. Rowan Williams after the latter retired at the end of December 2012. Archbishop Welby officially became the 105th Archbishop of the See of Canterbury on February 4, 2013 and will be officially enthroned on March 21, 2013 at Canterbury Cathedral. As an Evangelical Christian, it may seem that the elections of new heads of both the Roman Catholic Church and the Anglican Church do not matter to me. Nevertheless, the Bishop of Rome, being the leader of around 1.2 Billion Catholics throughout the world, is in a very influential position. The Archbishop of Canterbury, on the other hand, is leader of around 80 Million Anglicans worldwide. These new leaders, especially the Pope, can be important catalysts of change in our time. Hence, it is necessary for us to know where they stand on major issues of the world, both theologically and politically. In fact, after reading some of his books, I became an admirer of the previous pope, Benedict XVI, due to his conservative stance on important moral questions, not to mention his intellectual and theological acuity. Although I recognize our theological differences, it is vital for Christians, regardless of denominational affiliation, whether Catholic, Orthodox, Anglican or Protestant, to take a stand against the growing secular humanism of our society brought about by the minority, albeit noisy, advocates of homosexual “marriages”, freedom from religion, intolerant “tolerance”, abortion, fornication, and other forms of immorality. Let us pray fervently to God for all our pastors and leaders that they may lead us to a life of righteousness and strengthened faith in our Lord Jesus Christ. To Him be all the glory honor and praise, hallelujah! 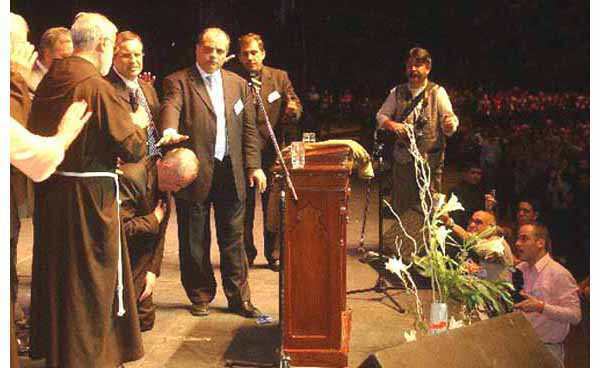 Pastor Carlos Mraida with his hand over Cardinal Bergoglio’s head; to Mraida’s left in the photo is Pastor Norberto Saracco of the Pentecostal Church of Argentina. The bearded monk with his back to the camera is Fr. Cantalamessa wearing the Capuchin habit. This encounter was born from a meeting at the Pontifical Gregorian Universtity in Rome, where the Catholic leader of the Movement of Charismatical Renewal met Protestants, who invited him to preach in their temples. This initiative spread and has generated gatherings like this one in Buenos Aires.